Dwayne Butcher: Can you talk a little about your recent MFA thesis exhibition at the Memphis College of Art? 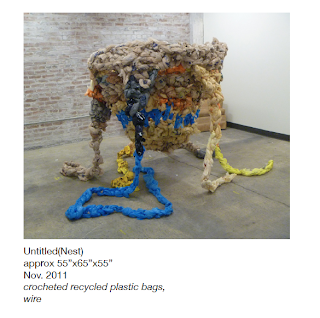 Kim Thomas: My thesis work was based on using recycled plastic bags as, not only the material for my work, but also to convey my personal fears and anxieties about climate change and environmental disaster. 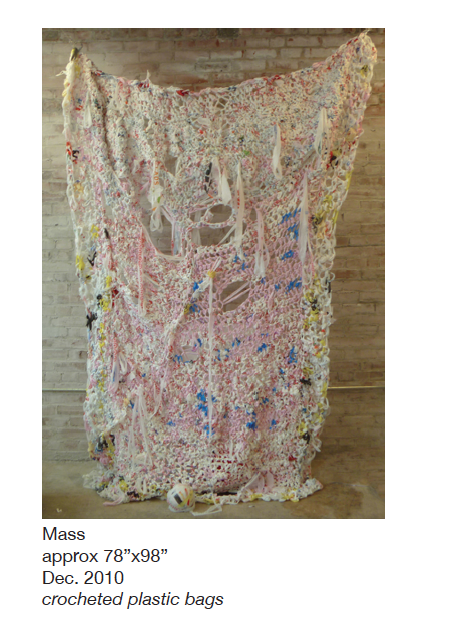 For the thesis exhibition, I knew I wanted to show work that was different from crocheting the bags, I had shown that work before in Memphis. I wanted to branch out; and get more specific about what I wanted the work to say. There were technically only three of my works in the show; but one of the pieces, Modern Sisyphean Struggle, has three forms, object, performance and documentation. 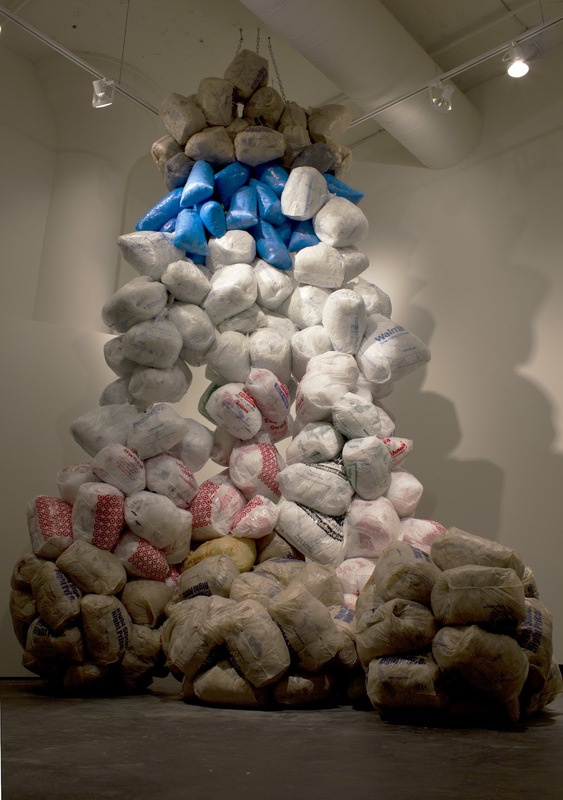 It Weighs Heavy On My Mind consisted on three huge, chunky chains of plastic bags stuffed with bags, which were strung together on wire. These three lumpy, caterpillar-like chains were suspended from the ceiling, a sort of weird cousin of an oak tree or something. I included two video works; the first was Black Mamba, a reference to Elle Driver’s dialog in Kill Bill Vol. 2 about the deadly attributes of the black mamba. After listening to this dialog a few times, I began to make correlations between the dialog and dangerous effects plastics have on the environment. 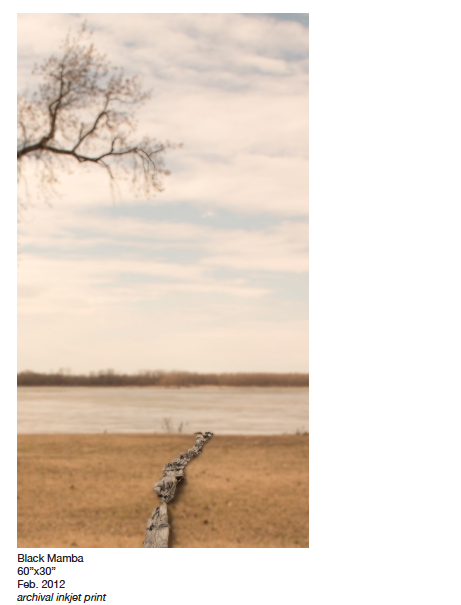 My metaphorical black mamba, a seemingly endless strand of black plastic bags, snakes along the edge of the Mississippi River, connecting our human actions with the environment those actions threat. The other video was a recording of the first movement of Modern Sisyphean Struggle; the video is the documentation of not only where the struggle between man and nature takes place (‘natural’ spaces, urban spaces), but just as in the Greek myth, Sisyphus was punished by having to roll a boulder up a hill, just to have it roll back down. Our generation and the generations that follow are burdened with the amount of waste we produce. 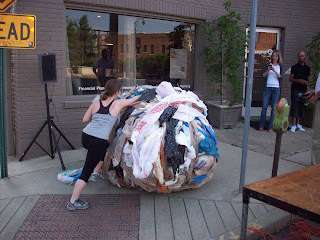 The video also documents the installation of the physical art object, a giant ball of bag approximately 5 feet in diameter. At one point I had to stop working on the piece because I needed to work out the logistics of getting out of my studio and into the gallery space; I actually finished the piece using a friend’s carport in East Memphis. And because the title ties the work to the myth of Sisyphus, I felt physical illustration of the pushing, or rolling, of the ball was an important element in conveying the sense of burden; so I pushed the ball down South Main St. during the show’s opening. Click here to see a video performance of Modern Sisyphean Struggle. DB. How did you get into using the plastic bags as a material? And what is the end goal of raising awareness of the negative impact these plastic bags have on the environment. KT: All the bags used are recycled, either from individuals or from bag recycling drop-offs at large stores like Kroger or Walmart. 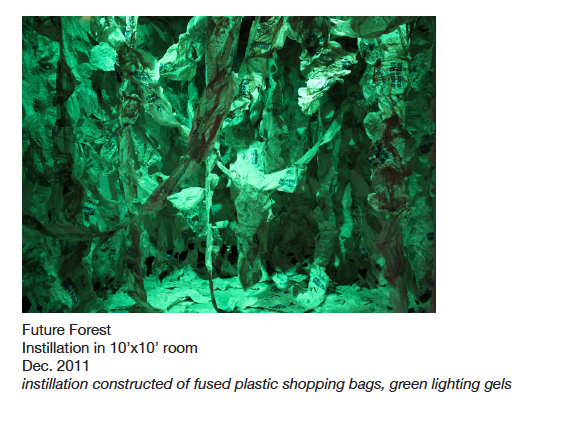 When I first started using the plastic bags, I was mostly just looking for a cheap, abundant material. I was raised to recycle, so the message of environmental impact was there; but it became much more import as the work developed. On a really basic level, I want people to see my work, say, “Wow, that’s a lot of bags!,” and hopefully remember the work next time they shop, and hopefully eliminate or reduce their own use of recycled bags. I’m the kind of person that reads the news and thinks, “Now there’s no doubt climate change is happening. We’re all f*cked.” Or at least the next few generations are. From the people I’ve told to and the research I’ve done, most people are just too caught up in everyday life to stop and question things like why something that they use for a few minutes is made out of a material that’s basically made to last forever. People are just beginning to question the safety of plastics that were once thought to be inert, like toxic phthalates used in polyvinyl IV bags. I’m not saying plastic shopping bags cause cancer, but plastic bags, and all plastic film, eventually tear apart. They don’t biodegrade. Instead, they become tinier and tinier bits of the same toxic material, which leaches into the soil, ground water and waterways. DB: How difficult/easy is it to work with the plastic bags? How do you manipulate them into the shape/objects you create? KT: I use the bags like fabric. 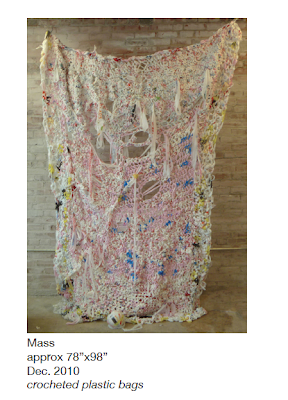 But working with the plastic bags has been about experimentation. When I first started using them in my graduate work, I used crochet to create abstract, organic figures; this involved a great deal of prep time, cutting the bags into strips, attached the strips together to form “plarn”(yarn made of plastic bags). Then I began to use an iron to fuse the bags together. As I experimented with the iron more, I learned how to manipulate the texture of the bags, and how I could use the heat to fuse the bags together to create works. 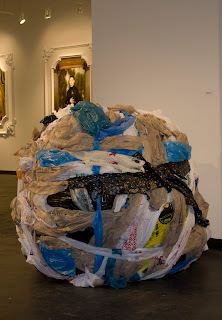 The giant ball for Modern Sisyphean Struggle was created mostly from attaching bags together into long strips with the iron, then rolling those strips onto the ball form. It’s basically an enlarged version of the balls of plarn I used to create crocheted work. I enjoy using nontraditional art materials. It allows me to escape all the preconceived baggage (excuse the pun) of traditional materials; for example if I work with paint, there’s a long history of painting that I have to contend with in making my work. Nontraditional materials often appropriate everyday objects presented in a new way, making viewers rethink the purpose of that material; I’m really interested in that dynamic. DB: How does performance play a role into your practice? KT: Performance is beginning to play a bigger role in the work. Performance via ballet and other dance forms was really my only exposure to self expression as a kid. With my current work, I set out on activity that is seemingly insignificant or even ridiculous. But in documenting that action and presenting it as art, the action is given meaning. I’m very inspired by the work of Kate Gilmore and Francis Alys. 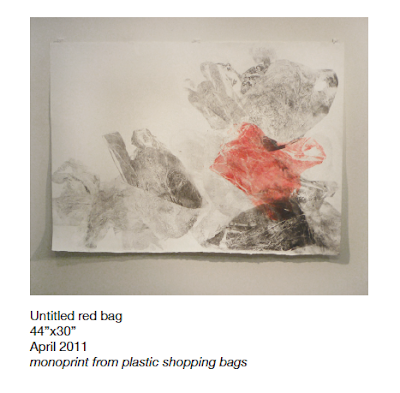 My work with the plastic bags is starting to approach protest art; and I see performance being a part of that. DB: What was the first performance you did? What other performances do you have in mind and how are they related to your overall theme as an artist? DB: You worked as a graphic designer before coming to grad school. How did you shift from design work to fine art? KT: That was actually a really long, emotional journey. I was never very encouraged to make art; I had to promise my mom I won’t tell my dad I was taking drawing as an elective my last semester of college. My father wanted me to be successful more than anything; but unfortunately he was very pragmatic about my degree being anything but English, pre-law or anything art-related. So I sort of randomly picked communications as a major. I got my first job at a weekly newspaper; and of course, was drawn to the creative side. The job taught me some graphic design; and I taught myself enough to land a graphic design position. Eventually, I had the need to make my own work. And after a couple of years working part time, taking art courses, and most importantly, making work, I got up the nerve to apply to grad school. Once I got in, I just pretended I was on Work of Art. Well, not quite... Getting an MFA is actually harder, and it puts you in the red, instead of the black, financially. But getting my degree has been the most rewarding, satisfying thing I’ve done so far; so I’m trying to work with that momentum and see where I can go from here. DB: You are from South Carolina. How did you choose MCA for grad school and what do you think of your experiences there? KT: I just got home from a post-grad visit back to the SC coast; so right now, I’m a bit home sick. A lot of it has to do which the beach though; jumping in the ocean is how I know how to deal with the summer heat! I can’t even find a spot to swim here in Memphis; if you know of a pool, lake, creek or whatever that safe to swim in, let me know please! But the majority of the time, I LOVE MEMPHIS! Back home in Charleston, there tends to be “groups” of arts, either your a commercial artist or a graffiti/urban artist or a fine artist. I don’t feel that here. Initially, I applied to MCA for two reasons: 1. I hadn’t missed the deadline to apply and 2. I liked that the graduate program is in studio art, instead of a specific medium. I don’t know it I could have had the freedom to explore as many avenues had I gone somewhere else. Also, I’ve meet so many amazing artists here; it’s really a great community. DB: What are your immediate and long terms plans, now that you have graduated and are all full smart?